Nina Chanel Abney, Listen, Linda! (YO), 2015. Unique ultrachrome pigmented print, acrylic, spray paint on canvas. This past summer, I curated Greek Gotham, a show with 16 New York artists that I chose to pair with concepts invented by the Ancient Greeks. I was very fortunate that Dio Horia in Mykonos, also decided to inaugurate their publishing house with a catalogue that I wrote and designed and which I’m extremely proud to have done. Given where we currently are with the results of the US presidential elections that took place three days ago (for the record, I am an American citizen and voted this time), I took the essay I wrote about Democracy, and reproduced it below. The artist I paired with Democracy is Nina Chanel Abney, and the specific work in the show was Listen, Linda! (YO), 2015. From the Greek demokratia: the common people, especially when constituting the source of political authority. The earliest democracy in the world began in Athens in 510 BC. Invented by Cleistenes, the new structure allowed free adult men who were Athenian citizens to elect their leaders through the casting of votes. Although far from being a just and inclusive system, the Greeks were the first to sketch out a new way of electing authorities, and for the first time, an organized group of people questioned the rule of aristocrats and kings. The Athenian democracy suffered many transformations until evolving into a structure that resembles what democracy is today. It is, however, the incomparable influence of the Greek concept of democracy in philosophy, its expansion around the world, and the prime example of citizen participation that we unquestionably owe to Ancient Greece. The exercise and concept of democracy in the United States rests on many pillars, but legal equality, the rule of law, and political freedom seem to three of the most important ones, those that people are actively and fiercely defending and looking to uphold. New York seems always strong on democracy across many layers, although it still faces asymmetries: gay rights, gender parity, racial equality, and an opportunity to succeed for those willing to put in the work. From hip-hop moguls to hip entrepreneurs, New York is embracive, innovative, color-blind, and ahead of the curve. Nina Chanel Abney’s work isn’t always political but when it is, it is done in an equalizing way. Abney’s paintings are democratic and broad-minded. If she has painted scenes of police brutality, the aggressors and the victims are white and black on both sides. Who has the right story? Have all the characters been allowed a reasonable amount of participation? The narrative is compelling without being alienating: there is a sense of humor conveyed through vivid contrasting colors, hard lines, and cartoonish figures, suggesting that in the end, everything will be all right. In Listen, Linda! 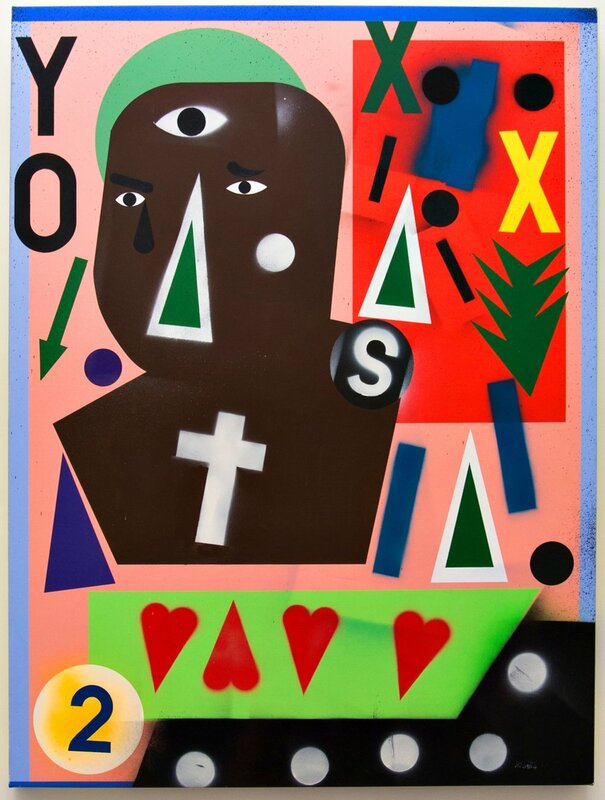 (YO), Abney takes over the surface of the entire canvas and adds her fair share of coded messages, numerology, and religious iconography: the number 2, the letter “x”, the word “YO”, a cross, an intuitive “third eye”, hearts, triangles, arrows, and circles. Like a geometric explosion of stenciled shapes, floating around a black abstract androgynous portrait whose emotions can only be hinted by a tear coming out of his or her eye. The tear in the subject’s eye may be a representation of how Nina feels when the people suffer inequalities, discord, and violence or where rights are abruptly curtailed. The rhythm and composition are decidedly urban like the up-tempo beats of a well-versed rap. The title of the painting is an allusion to a YouTube clip that went viral and has received more than 43 million views in the two years since it's upload. A homemade smartphone video shows a child arguing with his mom (who is filming him) about why he should have cupcakes for dinner. For three minutes, he calls his mom by her name “Linda” and also “honey,” using all sorts of antics to persuade her. The cryptic message of the painting, along with the title, may hint at Nina’s deep longing for a better democratic system and also encouragement to those who don’t feel heard. If we keep repeating the message time and again, with tenacity, optimism, and conviction, things will change, there will be a fair system, discrimination will diminish, and people will feel protected and validated. It's the way any real democracy should operate.